Mitski makes it look easy. Whether it be her lyrics, her voice or the way she weightlessly jumps around on stage during live performances, every aspect of performance seems to flow effortlessly into the next. Her compositional skills have put her in the spotlight as one of the most advanced songwriters of our time, and her newest album, Be the Cowboy, only solidifies her reputation. Stepping away from indie rock roots, Mitski floats into an entirely different sonic realm that only she could exist in. A bold leap from her earlier work, Be the Cowboy proves that today’s innovators belong in the realm of pop music. Once buried in distortion, Mitski’s smooth vocals shine over glamorous synthesizers, jittery disco guitar and a newfound confidence that shows her melancholic lyrics in a new and brighter light. The shift in sound takes her out of the ever-diluted arena of indie-rock and into the forefront of the slow but sure return to disco-infused pop. From the wobbly synths on “Why Didn’t You Stop Me” to the romantic static of “Pink in the Night” her ambitious exploration into this new territory pays off with a perfected balance – her persona, while somewhat restrained, is radiant. She is vulnerable yet poised, forlorn yet independent, at the mercy of her lovers yet totally in control. Lyrically, the record is similarly confessional to her previous releases. Mitski has always been an exceptional songwriter, and Be the Cowboy is no different. However, the tone of her words has taken a subtle change of direction. Where her lyrics were once diary-level specific to her own experiences, they are now artfully crafted to to showcase both personal experience and relatability. While hard-hitting lines like “Just how many stars will I need to hang around me / to finally call it heaven?” and “Nobody butters me up like you / and nobody fucks me like me” can be found on every track, there is a simultaneous lightheartedness that pervades the record. Rather than basking in her own loneliness, she channels her woes into a polished pop that is universally danceable. 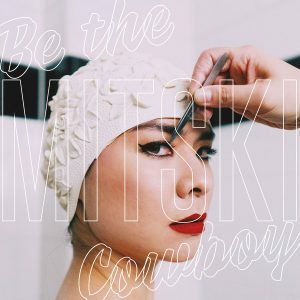 Lyrically, compositionally and sonically, Be the Cowboy pushes every possible boundary it can, making it Mitski’s most powerful album to date. Undoubtedly, Mitski has found her voice with unwavering aplomb. As she teases her new sleek persona, she lifts herself to epic heights of stardom without sacrificing her grounded outlook. She’s expressed before that artists are not special or different than everyone else and writes with this in mind, the result an anthemic record that anyone can empathize with. Choosing to embrace self-assurance amidst heartbreak, Mitski sensationally gives us all the confidence we need to be the cowboy, whatever that may mean.